Repeal our cherished Stand-Your-Ground law. Set up a statewide registry of every gun owner in Iowa. And, most importantly, pass ‘Red Flag Gun Seizure Order’ legislation in 2019. 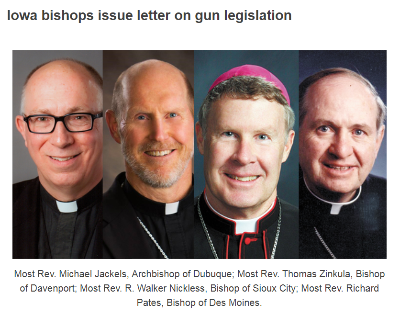 That was the gist of the statement issued by leaders of the Catholic Church here in Iowa this week, with bishops from Sioux City to Dubuque adding their name in support. Make no mistake, for lawmakers who are on the fence about whether or not to vote for ‘Red Flag Gun Seizure’ legislation next session — their decision just got a lot easier. I need your signed petition, opposing this horrible legislation, now more than ever. More on that below. As a reminder, ‘Red Flag Gun Seizure’ legislation promises to be a hot issue once the General Assembly kicks off in early January. That’s because Rep. Matt Windshitl, Speaker Pro-Tem of the Iowa House, has made it clear that he’s working both sides of the partisan aisle to whip up the 51 votes he needs to pass this legislation! If passed into law, so-called ‘Red Flag Gun Seizure Orders’ would allow government agents to bust into your home and seize your guns even if you haven’t been arrested — much less convicted of anything! Or maybe it’s your anti-gun college professor who simply hates gun owners. Can you imagine what an embittered ex-spouse could do to you if Iowa were to enact this legislation? Once your guns are seized, you’ll be spending weeks in court and thousands of dollars in attorney’s fees to try and get them back. And given how embittered Iowa prosecutors and sheriffs departments have been towards gun owners since we passed ‘Shall Issue’ and ‘Stand-Your-Ground’ law — I can’t imagine the harm that could come from giving them this power. We need to stop this legislation, right away! That’s why I need you to sign your petition opposing ‘Red Flag Gun Seizure’ legislation TODAY! Some may be tempted to sit back and not take this threat seriously, trusting in our Republican majorities in Des Moines to stop it. House leaders have simply collapsed time and time again. First it was their efforts to create a searchable database of every gun owner in the state with a carry or purchase permit in 2016, a study bill that we stopped. Then they tried to gut Stand-Your-Ground law by removing the immunity language from the bill in committee in 2017, language we forced them to replace during debate. And in 2018, the House leadership team worked behind the scenes to successfully kill Constitutional Carry in the days after the Parkland, FL shooting. So when House leaders like Rep. Matt Windshitl talk about ramming ‘Red Flag Gun Seizure’ legislation into law, we need to take them at their word — especially with Republicans all over the country caving in on this bill! Thousands of gun owners have already signed their petition opposing this legislation. If you haven’t yet signed YOUR petition, please do so at once! In addition to your signed survey, I hope that you will immediately renew your membership in Iowa Gun Owners for 2019! We are going to need to mobilize an army of gun owners if we are to stop this bill. That means direct mail, mass email, targeted social media — and likely radio and TV ads — as well. So please take a moment to renew your membership in Iowa Gun Owners for 2019 right away! Your membership level is entirely up to you. Liberty level memberships are just $35, and come with a membership card and decal. Freedom Level memberships are $75, and come with your IGO member card, decal, and a FREE IGO T-Shirt. Patriot Level memberships are $125 and are the highest level of annual support a member can provide. You’ll get everything the Freedom Level membership includes — and it provides us an extra amount to fight with, for $125! And if you’ve been wanting a lifetime membership, to make a permanent investment in the fight for gun rights here in Iowa, we now have payment options to fit every scenario. If you have already renewed your membership for 2019, please consider a special donation to help us shut down these ‘Red Flag Gun Seizure Orders’ right away! You can make that donation right here. Whatever you do, please sign your petition, as that is most important. P.S. With the Catholic Church coming out with a statement today, calling on the legislature to pass ‘Red Flag Gun Seizure Orders’ next session, gun owners need to stand together now more than ever. It is vital that you sign your petition opposing this legislation RIGHT AWAY! And then take a moment to renew your membership for 2019 today, at whatever level you choose!